FAQ's - "An Empty Sun"
Given the mathematics involved in calculating the mass of a heavenly body, one would assume, or deduce, that the mass of a Sun that is hollow would be much less than a Sun that is not hollow. How do you explain this? What about the Earth's magnetic field? Is our Earth hollow? If the Sun is hollow and has only a skin of Hydrogen why hasn't that skin burn off? Where does all the fuel come from? How do you define "Space" in the definition of a volume? what would be the outcomes of you're theory with regard to black holes which are alleged to be at the center of every galaxy? Your idea goes against the established notion as to how the sun works. How can you defend that? Are you challenging the laws of gravitation? Will you debate your idea? A good theory should have a prediction. Do you have one? The Sun's interior non-space is generating gravity. By hollow, I assume you mean a relatively empty space? The video suggests that under these conditions the nature of a vacuum is taken to its extreme and becomes a rip in the fabric of space, a condition that mass/energy/space reacts to as if it were a gravitational phenomenon - which is precisely what it is. You don't need to call upon an accelerated plasma to generate a magnetic field, but that said, I believe it is entirely possible that the earth mimics the Sun, but in miniature. Although on a much smaller scale than the Sun, one can deduce that the Earth has a hot interior, and the conditions are present for the Earth's internal mass to be in a plasma condition. The Earth rotates, and charged plasma is susceptible to here is a dynamo effect. It might explain this postulated behavior, for which the the author Neil Adams has an entirely different causal explanation. Also, it could go some way to help a string of puzzled engineers who can't understand how dinosaurs could function in our heavy gravity. However intriguing, I have only explored a little in this direction. Perhaps there is less easily discernible empirical evidence and I cannot think of anything predictive. It might be it hard to prove one way or the other - in which case may become a subject for endless debate. Two mechanisms for hydrogen replenishment occur to me. 1. Our Sun is enveloped in a huge magneto sheath called the heliosphere which extends far beyond the outer planets. This sheath might be considered a digestive system for the Sun. As the Sun sweeps around the Milky Way galaxy , which it orbits once every 250,000,000 years, the magneto bow wave of the solar magnetosphere slams into particles of dust and knocks off lose electrons. This gives the particle a static charge, which makes it sensitive to the Sun's magnetic field lines. The particle follows the field lines into the north and south pole of the Sun. Like a whale hunting krill, the Sun sweeps up considerable quantities of these. The Earth's Auroras are miniature versions of what the Sun does. The Sun must occasionally collide with the dense gas and dust globules that litter the Milky Way. At times like that, the Sun must be in a feeding frenzy mode. Lucky for Earth, the majority of the incoming material reaches the Sun without intersecting the planetary plane. Even so, those impact craters that pockmark our planets and moons have to come from somewhere. 2. Then there is the "Something for Nothing " postulation which I believe now has empirical proofs. In this scenario the mere act of the Sun sustaining an absolute vacuum is a free lunch. As attractive as this explanation is, I have a hard time wrapping my mind around it. Perhaps I'm old-fashioned or have lived in the ghetto too long. There's got to be a catch. Space and volume are two different things. Space is of this Universe, a volume - in the sense that I mean it - describes the location (out of space) in which non-space, or a vacuum can exist. what would be the outcomes of your theory with regard to black holes which are alleged to be at the center of every galaxy? Basically, it depends on the accretion disk that surrounds the heavy pre-black hole object. Since the charged plasma accretion disk is very hot and whirling very fast. The magnetic coherency of that structure must be very powerful indeed. As I mentioned in the video, the magnetic consideration has the potential to be 10 x 33 powers stronger than the gravitational force. It's a little bit like a mouse tethered to an elephant: it's NOT what the heavy gravitational object in the center wants to do, it's the charged plasma that gets to be the "decider". With the data available to me, that's as much as I can figure out at present. I am more than aware of the hydrogen/fusion core model and its proponents. It is the human condition that most adherents might cling to the hydrogen/fusion core model, because it is hard to conceive of any other means of solar propagation. Mass and gravity have always been considered inseparable, and I am cognizant of the fact that an empty sun might be viewed as a rather outlandish idea. However, those who teach and present the hydrogen/fusion core model as a unquestioned fact ought to be ashamed of themselves. It is sloppy and unscientific. Such curriculum ought to be based on the observations at hand rather than drawing erroneous conclusions. I think of these as neo-Ptolomeans - science priests, hopelessly stuck in their own notions of solar propagation and the facts be damned. The hydrogen/fusion core model has cleared no observational hurdles, no predicted observations. As a consequence of such disastrous assumptions, fusion experiments based on these have ended in failure. This has been going on for the past 50 years and has yielded no fruit, because the science is fundamentally flawed. It is consuming huge resources, and it is time for this nonsense to stop. I'll discuss solar propagation any time although I have no interest debating the subject with 'opponents' who have turf to defend. I've offered my observations, suggested some predictions. I am not interested in pithy sparring, taking offence or offending anyone. No. The laws of gravitation do a perfectly good job of describing the actions of bodies in space-time. I am suggesting that a the force of gravity may not be inextricably bound by a given quantity of mass in its ground state. What do I mean by ground state? The relationship between gravity and mass appear to be inviolate in three three basic states of matter, solid, liquid or gas. I am suggesting that mass in the fourth state - a plasma state - can induce gravity under certain circumstances. That is, affording more gravity than can be accounted for by a corresponding quantity of mass. To date, no experiments with plasmas have had a gravimeter placed within the vicinity. It would be interesting to see if there is a response on a gravimeter near a Z-pinch, for example. 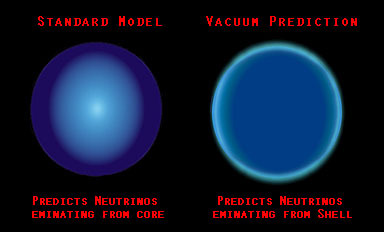 One possible way to verify this model would be to collect data on the direction of neutrinos coming from the sun with some accuracy. If the vacuum model is correct, we should be observing a limb effect, neutrinos coming from the edge rather than from the center of the Sun. This is because nothing, including neutrinos can pass through the body of an absolute vacuum Sun. Accordingly, they would have to be generated in the outer layer. The result would be a halo or limb effect. Calculate the mass necessary to inaugurate nuclear fusion in a classic proto-sun model. This will slow the angular momentum/rotation speed as then proto-sun expands. See if it tallies the actual rotation speed of the sun. This calculation ought to be possible. If the reader is qualified and interested, I will commission the project. The math must stand up to rigorous peer review. I will pay extra for a scripted GUI interface that will allow the user to adjust the parameters. If you are interested, please contact me. * The Sun aside, Saturn and Jupiter make up the majority of the Solar System's mass. These bodies would be less likely to have changed rotational speeds from random strikes of external objcts. Hello, my name is Stephen Goodfellow. If you will bear with me for the next ten minutes, I will show you something that may completely change the way you perceive the Universe. In this short video I shall illustrate my outrageous assertion that the sun is a shell of hydrogen with an absolute vacuum interior - a vacuum that induces gravity. Furthermore, I shall support this assertion with empirical observations that I have collected over the past 30 years. Are you ready? Good. Let's begin. Milk added to a stirred cup of coffee outlines a vortex, which consists of a high pressure exterior and a low pressure center. The vortex behaves in a manner identical to that of the planets orbiting the Sun, in that both phenomena obey Kepler's Laws of Planetary Motion. Weather it be clotted cream swishing around a low pressure center, or a planet orbiting our Sun, their behavior is essentially identical. Now - this is the interesting part - The depression in the center of the coffee is a relative absence of matter producing an effect identical to that of planets and Sun mutually attracted to one another. In other words, one event is brought about by a concentration of mass, the other by an absence thereof. This induced gravitational attraction takes on many related manifestations in nature, some of which we are likely to come across, whether it be in the form of water going down a drain. Although the spiral galaxies means of propagation remain a mystery, one cannot but be struck by the similarities between these and their more earthly counterparts. Consider the organ with which we hear, the eardrum. Sounds that the inner ear receives and decodes are compressional waves - that is, areas in which there is more air, between troughs of less air - or high and low pressures. Through vibration, the ear translates these waves into electrochemical impulses which are sent to the brain - and that should be all there is to it - except that the ear actually performs another seemingly unrelated function. The ear has two semi-circular canals which inform the brain as to your position in relation to our planet's gravitational field. Now that is really, really interesting; one organ performing two seemingly different tasks. One part of the eardrum works with pressure, the other, with gravity. Now, if pressure and gravity were two fundamentally distinct and separate forces, should we not expect to find two distinctly separate organs to discern these two forces? After all, this is the usual order of things. The heart, uniquely suited to pump blood fulfills it's specialized role. Lungs specifically supply oxygen to the body. So why should the inner ear neatly perform two functions? Could it be that pressure and gravity are manifestations of the same force? Dictionaries define a vacuum as "A space absolutely devoid of matter." And though it seems a reasonable statement, it is not correct. A better definition would be, vacuum is "A volume with no space in it." Wherever we look in the universe, absolute vacuums" are nowhere to be observed. Now that is pretty astonishing. Because, for the longest time space was thought to be an absolute vacuum. When Einstein produced his work on Relativity in the early part of the 20th century, he had no way of knowing that space was not a vacuum. We know that light travels upon the fabric of space, but no observation has ever been made of light propagating through an absolute vacuum. pass through a given cubic centimeter at any given time. Space is a fabric of mass/energy and the laws of pressure are just as relevant in outer space as within the boundaries of our own atmosphere; it's just on a much, much bigger scale. Let us now perform a simple thought model. Let's imagine that I, by calling upon some mysterious power, can force the mass/energy out of an area of given volume. The first thing you would notice is that it would form into a sphere because of the pressure of the air pushing in on it equally from all sides. If you were able to observe the sphere - which you can't and I'll explain why shortly - it would be completely dark. Within this volume, there is no time nor temperature. Now, the reason you could not directly look at this absence of mass/energy is because the exterior atmosphere would fall in on it with such intense pressure that it would glow. ...And that attraction, that crushing in of the exterior air would be indistinguishable from gravity. Could such objects really exist in reality? Together with solid, liquid and gas, plasma is the 4th state of matter. Our Sun is a large charged plasma ball. Because the sun is rotating, this creates a dynamo effect which allows the plasma to exist as a single unified magnetic entity. How powerful is this effect? If you look at the shifting structures in the suns outer layers, you see quite plainly that they are not visibly effected by the crushing gravitational attraction of the Sun. This is because the gravitational force is some 10 x 33rd times weaker than the magnetic force (thats a number with 30 zeros behind it.) In other words, it only takes a fraction of the plasma's magnetic potential to overcome the gravitational influence of the Sun. Here are three persuasive observations that lead me to believe that the sun propagates in this manner. 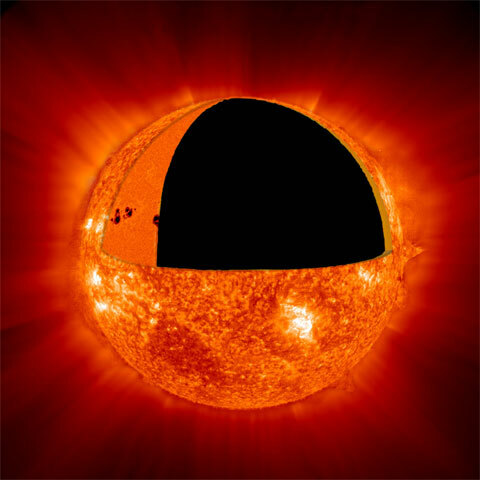 Sunspots are dark depressions in the Sun's photosphere. The reason they are dark is because we are looking in towards the absolute vacuum of the Sun through this temporary thinning of solar hydrogen. 2. Helioseismology. Scientists have discovered that the sun rings, much like a bell. These oscillations are much easier to propagate through a thin plasma shell, rather than through an increasingly dense object. One might compare a bowling ball and a bell; the bell is much more likely to successfully oscillate. If the solar system formed by accretion of interstellar matter, then our Sun ought to be rotating much, much faster than it is. Like a spinning ice skater accelerating by drawing in their arms, the Sun - in the center of the solar system - ought to have the lions share of angular momentum, but when we look at the system, we find that Jupiter, our largest outer gas-giant planet, has the majority of the angular momentum. Jupiter rotates once every 10 hours, whereas the Sun rotates only every 30 days. Picture a proto-star, somewhat heavier than Jupiter. The dense pressure in the interior inaugurates nuclear fusion. A charged plasma is created. The dynamo effect created by the rapidly rotating proto-Sun supplies a unifying magnetic field for the plasma. Stripped Electrons and protons form into camps of like particles. The proto sun rapidly expands, and in doing so, like a spinning skater putting out their arms, the rotation slows. This inflation of the Sun leaves non space in it's wake; induced gravitational attraction is brought about, restraining the further outward flow of matter. The opposing forces of magnetic repulsion and Induced gravitational attraction brings the solar shell into equilibrium. The Sun's shell of matter is heated under pressure from magnetic plasma repulsion and induced gravitational attraction. And now the the process repeats, The sun is in it's sustaining cycle. The dense pressure of the suns matter crushing in on the non-space heats it, sustaining nuclear fusion, which in turn sustains the plasma. The fuel is hydrogen.